Swimming pools are considered as one of the best manmade creations due to the many benefits that they provide. First, they increase the value of any home. California is known for their incredible weather year round making the daily use a swimming pool in Riverside County a reality. Swimming Pools improve blood circulation, minimize or even cure a variety of respiratory diseases, facilitate weight loss and more. Medical experts even advise patients to include swimming in their regular physical routine. This is why regular pool cleaning service is a necessity; more so when there are heavy rains that can affect your pool’s water balance and safety. Some people with pools at their homes believe that a pool cleaning service is not necessary after a heavy rain. They claim that they themselves can easily rid their pools of the fallen leaves, dirt and other debris that come from heavy rain and strong winds. There is a possibility that heavy rains can affect the pH level of a swimming pool. When this happens, chlorine’s power to kill harmful microorganisms is minimized. This can cause skin itchiness and eye irritation. This is also seen as the reason for a pool’s overwhelming chlorine smell. Swimming Pool fixtures, accessories and equipment can be affected. Rainwater is naturally acidic. Although its acid level is relatively low, and is therefore deemed safe, it is when its natural acids combine with the chemicals in the pool that problems arise. One of the issues is corrosion of the metal fixtures and accessories of the pool. Swimming Pool water can get cloudy. This happens when the water has a lower than required pH level, thus making it too alkaline. This can lead to surface water scaling and cloudiness, which might cause you, your family and friends to skip using the pool which costs you to keep up. Your swimming pool might become a breeding ground for bacteria. As mentioned previously, chlorine’s ability to protect the pool’s water from bacteria and contaminants weakens when the pH level is affected. 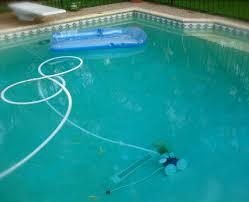 This is why you need the services of expert pool cleaning in Riverside County. Why risk you and your family’s health with a contaminated swimming pool if you can do something about it? Contact a reliable Riverside County pool cleaning service and continue enjoying the benefits that a clean and safe pool can provide.